and, since 1991, known as Mukacheve in the Mukachevskiy (Mukachivs'kyy) rayon (district) and the Zakarpats'ka oblast (county) of Ukraine. Other spellings/names for Mukacheve are Mikachevo, Munkachevo, Muncaci, Munkatch and Mukaczewo. 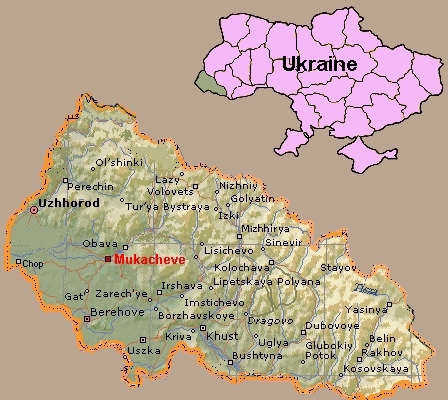 Mukacheve is located 22 miles ESE of Uzhhorod (Ungvár), 16 miles N of Berehove (Beregszász), as indicated on the map below. Mukacheve is a city located in the valley of the Latorica river in the Zakarpattia Oblast, in southwestern Ukraine. Serving as the administrative center of the Mukachivskyi Raion, the city itself is also designated as a separate raion within the oblast. Mukacheve has been settled since prehistoric times. Archaeologists have discovered settlements in the vicinity from the Neolithic Period, the Bronze Age, the Iron Age, and the Slavic period (8th-9th century). In the 10th century, Munkács belonged to Kyivan Rus', and in the 11th century, to Hungary. The fortress castle, rising high above the town, was destroyed by the Cumans in 1086 and by the Tatars in 1241. It was rebuilt by Fedir KORIIATOVYCH, who also built Munkács Saint Nicholas's Monastery. By the end of the 14th century, Munkács was an important manufacturing and trading center on a trade route between Hungary and Galicia. In 1445, it was granted the rights of Magdeburg law. Because of the monastery, the town became a cultural and religious center in the 15th century and until the end of the 18th century, it was the seat of the Munkács eparchy. Owing to its strategic location, Munkács was contested frequently by the Habsburg dynasty and Transylvanian dynasty in the 16th and 17th centuries. 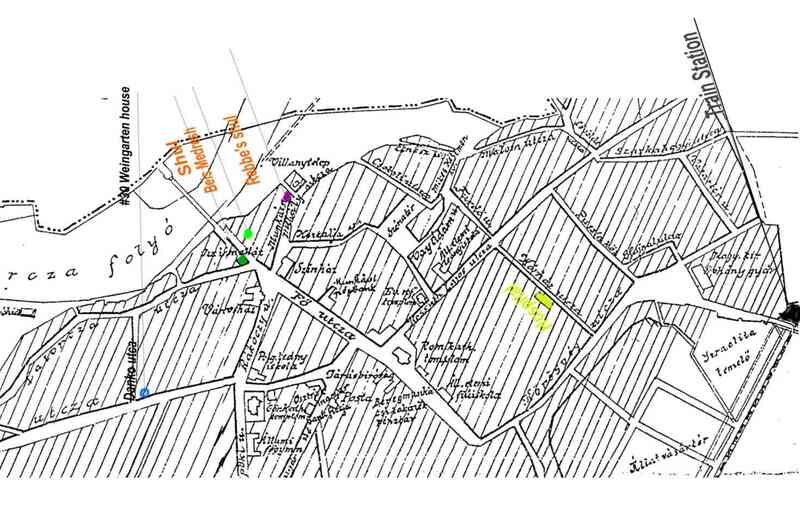 There are documents in the Berehove (Beregszász) State Archives indicating that Jews lived in Munkács and the surrounding villages as early as the mid-17th century. In 1736, there were nine Jewish families living in Munkács and by 1741, there were 80 Jewish families who, at this time, organized and constructed a synagogue. Mukacheve today, better known as Munkács by the Jewish community that once flourished there, is at the nexus of a region that has changed sovereignty five times within the past one hundred years. The changes are reflected in the various names by which this region, known as Sub-Carpathian Ruthenia in English, has been called: Carpaten, Podkarpatskaya Rus, Carpatho-Ukraine and today, Zakarpats'ka Oblast of Transcarpathia (Sub-Carpathia). The region's administrative center has always been Ungvár (Uzhhorod) and its commercial center Munkács (Mukacheve). For most of its history, the town was called by its Hungarian name, Munkács. However, maps published at different times have displayed the name as Munkatsch (German), Munkacz (Polish), Mukacevo (Czech), Mukačevo (Russian) and in its current Ukrainian designation, Mukacheve. For a period of eighteen years, from 1920 until November 1938, Sub-Carpathian Ruthenia was a part of the newly created Czechoslovakia. At first, the Jewish community grew slowly: 1815 (165), 1830 (202) and by 1842, the Jewish population totaled 301. There is a list of Jews from Munkács which shows 247 of their number (including the name of my gggrandfather, Izak) serving in the local militia during the Hungarian revolt of 1848, against the Austrians. Munkács had several Jewish newspapers and periodicals published in Yiddish, Hungarian and other languages. A Hebrew printing press was founded in 1871 and soon the town became one of the most important publishing centers in East Central Europe. By 1891, the Jewish community had grown to 5,049 individuals, representing nearly 48% of the population of Munkács. Before the mid-19th century, Munkács became one of the important centers of Hungarian Hasidism and later, of Czechoslovakian Hasidism as well. The yeshiva, founded in 1851, reached the peak of its activity under Rabbi Lázár SPIRA, Chief Rabbi of Munkács (1914 to 1937). At its height, the yeshiva had 250 students from various countries. During the period of the Czechoslovakia Republic, the Jewish population rose significantly to 10,012 in 1921. The Jewish community continued to flourish and Zionist, as well as non-Zionist, political parties were active in the community. Four newspapers and periodicals were published in Yiddish. Many Jews were professional people and the community included 21 lawyers, five pharmacists and number of engineers and administrative officials. The community maintained a number of talmudei torah, elementary schools, and Beth Jacob school for girls, an orphanage and a few kindergartens. A Hebrew elementary school was opened in 1920, joined in 1925, by the first Hebrew secondary school to be opened in Czechoslovakia. In 1939, the Hungarians seized and annexed Subcarpathian Rus—including Munkacs—taking advantage of the dismemberment of Czechoslovakia. While anti-Semitic legislation was introduced by the Hungarian authorities, Subcarpathian Rus, remained a relative haven for Jews. However, Jewish livelihoods were gradually undermined. In 1941, the Jewish community numbered 13,488 (representing 42.7% of the total population). Their numbers continued to grow to be close to half of the city's population. In 1940, hundreds of Jews were drafted into Hungarian labor battalions for forced labor service on the Eastern front, where many died. In late July and early August 1941, dozens of families without Hungarian citizenship were expelled is Stanislawow in Eastern Galicia and to Kamenets-Podolski, Ukraine, were many were murdered. In 1941, the Jewish community numbered 13,488 (representing 42.7% of the total population). Their numbers continued to grow to be close to half of the city's population, until the spring of 1944. After the Germans occupied Hungary March 1944, nearly 15,000 Jews of Munkács and Jews from the surrounding villages, as well as those from a number of settlements in the Berehovo the district, were concentrated in an improvised ghetto and a Judenrat (Jewish commission) was appointed to govern the ghetto. They were interned in the ghetto about a month until mid-May 1944, when they were forced into cattle cars and transported by several trains to the Auschwitz extermination camp. 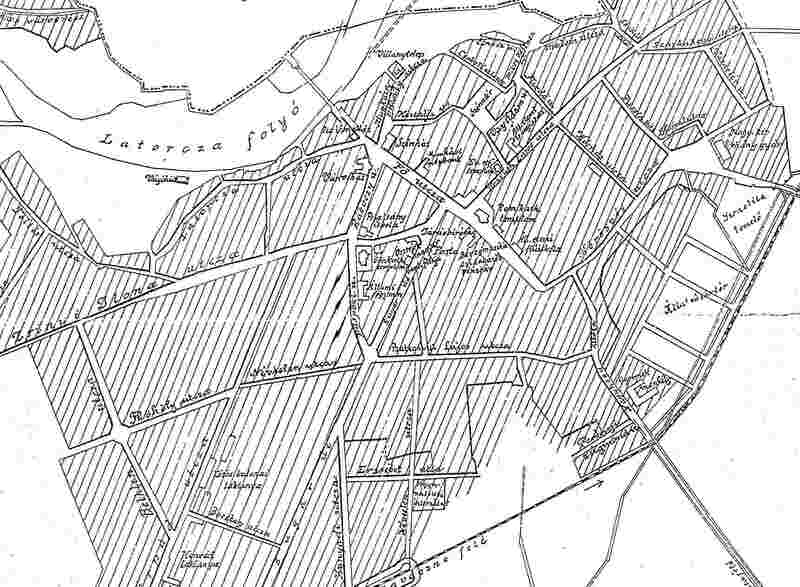 This flourishing community ceased to exist on 30 May 1944 when Munkács was pronounced Judenrein (free of Jews) after ghettoization and the deportations to Auschwitz. A great number of the Jews of Mukacheve were murdered in the Holocaust, but a relatively large number, perhaps upwards of 2,500 Jews returned the city after their liberation. After Mukacheve was annexed by the Soviet Union, many left for Czechoslovakia or emigrated to Palestine and other countries, many secretly. The surviving Jews from the surrounding villages, who could not find a viable Jewish community in their villages, migrated to the nearest urban settings where Jewish life, albeit discouraged by the Russian regime, continued to practice their Jewish traditions in secret. In addition, Jews along with others, were sent by the central government to "Russify" the heterogeneous ethnic mix of the region. A large number of Jews were still living in Mukacheve during the 1950s and 1960s, but at the first opportunity starting in 1969, a large number of the Jews of Mukacheve and other Sub-Carpathian towns and villages immigrated to Israel, United States and elsewhere. Today, Mukacheve is experiencing a Jewish renaissance with the building of a new synagogue (July 2006), establishment of a supervised kosher kitchen, a mikveh, a Jewish summer camp, in addition to the prayer services which take place three times daily. The new synagogue was dedicated on the site of a pre-war Hasidic synagogue, with the attendance of hundreds of local Jews from the Sub-Carpathia region and a delegation of 300 Hasidic Jews from the United States, Israel and Europe, headed by the spiritual leader of Munkács Hasidic Jewry, Rabbi Moshe Leib RABINOVICH, who currently resides in Brooklyn, New York. Mukacheve has several machine-building plants, a large branch of the Fischer Ski factory, a furniture factory, and a food industry. A branch of the Ukrainian Scientific Research Institute of Forest Management and Agroforest Amelioration is located in the city. Its chief architectural monuments are the castle (built in the 14th century and rebuilt in the 18th century), a chapel in Gothic style (14th century), the White Building (a baroque monument of the 17th century rebuilt in 1746), the arsenal (now the regional museum) built in 1624, Saint Nicholas's Church (Cathedral from 1806) and Rakoczi Palace. Copyright © 2008 Louis SCHONFELD All rights reserved.